Protecting you from bad movies since 1999. Rotten Tomatoes is an industry leading website dedicated to collecting film reviews from professional critics and fans, movie information and film news. As one of the most respectable review aggregator on the internet and its innovative scoring system, Rotten Tomatoes is regarded by majority of the world as the go-to site for find out which movies are worth watching and which are not recommended. Stop Watching Bad Movies! The name of this site is derived of the cliché audience behavior in old stage plays, when poorly preforming actors were commonly hit by rotten tomatoes and vegetables which were thrown from the audience. On this modern review aggregator website, critics have the same options – if they have liked the move they give it fresh tomato, but if they don’t recommend anyone watching this movie, than they give it rotten tomato. Rotten Tomatoes is visited by over 30 million visitors each month and it offers its services to everyone who has modern browser or portable device (PC, Mac, iOS and Android). Ultimate database and online community for movies! 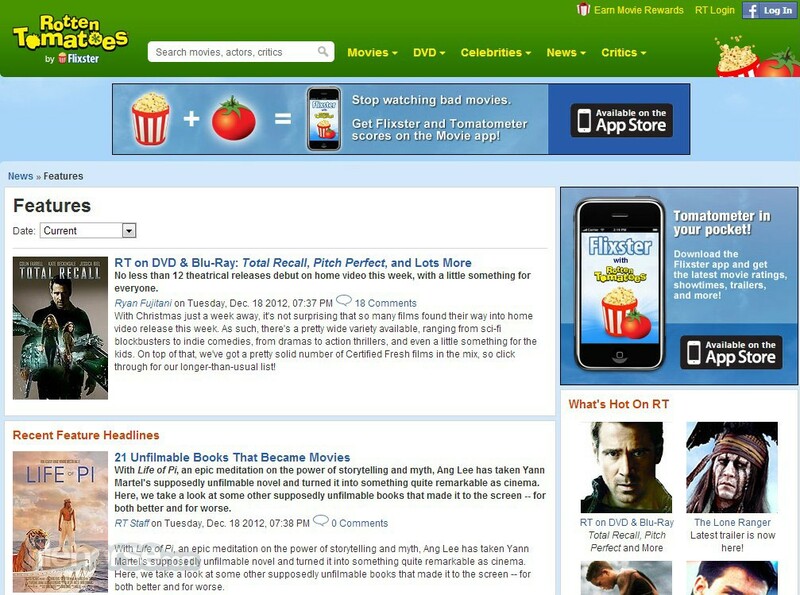 Born as a popular movie review website, Rotten Tomatoes has managed to transform itself into popular online destinations for all movie lovers, providing everyone with not only most coveted review aggregator system from all other online sites, but also providing its community with the wealth of data that everyone can appreciate (such as DVD info, release dates, cinema listings, film critic reception, user reviews, celebrity data, film gross in US, and more). 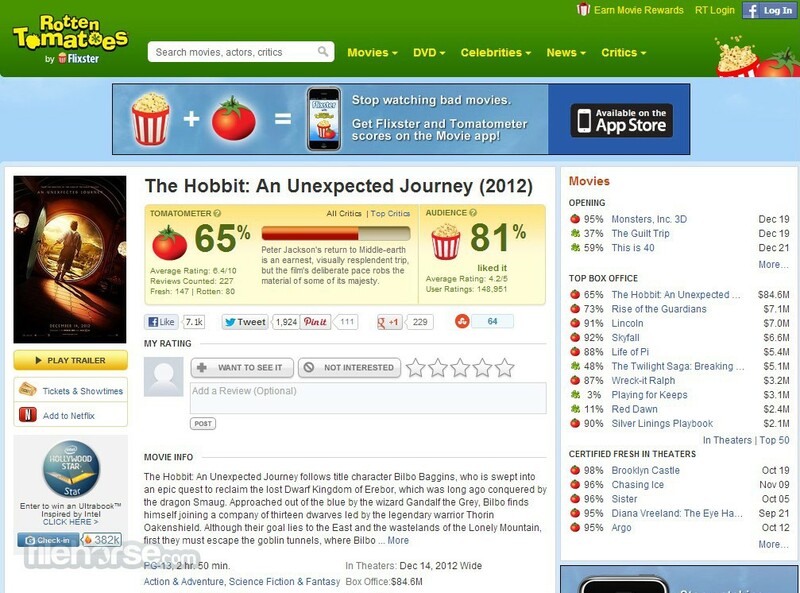 Since its creation in distant 1998 by Senh Duong who worked on this site as his side project dedicated to place all the reviews from famous US sources in one place , Rotten Tomatoes managed to elevate itself into not only a popular movie centric site, but also into one of the most popular websites of them all. This rise was especially apparent after the acquisition of Rotten Tomatoes by the popular film streaming service Flixter, which is subsidiary of Warner Bros.
How did the Rotten Tomatoes managed to become so popular? This was possible because the final film score gathered from the aggregation of certified reviews form all around the world (mostly US) is not represented by the 10 out of 10 number. Instead of that, the final score is represented by the clear mathematical ratio between positive and negative reviews (fresh tomato or rotten tomato). Using this way of ranking movies, visitors can very easily see what is the general consensus of the movie, is it recommended to be viewed by most, half or just few of certified reviewers (by current count there are 304 of them). Generally speaking, if the movie receives fresh score of 60%, then it is considered to be accepted by the reviewing community as a movie that is recommended to be seen. Europe , India and Australia have their own localized version of Rotten Tomatoes site, all with their set of certified review sources that are better suited for their local needs. Stop Watching Bad Movies! Visual design of Rotten Tomatows is perfectly suited for the needs of the website that has a lot of daily content and many separate sections (Movies, DVD, TV, News, Critics, Picture Galleries, Trailers & Clips, Forum, …) that all have a lot of unique content. The greatest focus that the site has is offcourse its review aggregation scores, which are presented on every page of the site in the left bar that hosts list of movies that are opening in current week, top box office, and upcoming films. All the films in that list have their Rotten Tomato score and box office gross for previous week, however, dedicated pages for movies themselves have much more detailed data about its score, release info, cast and crew. 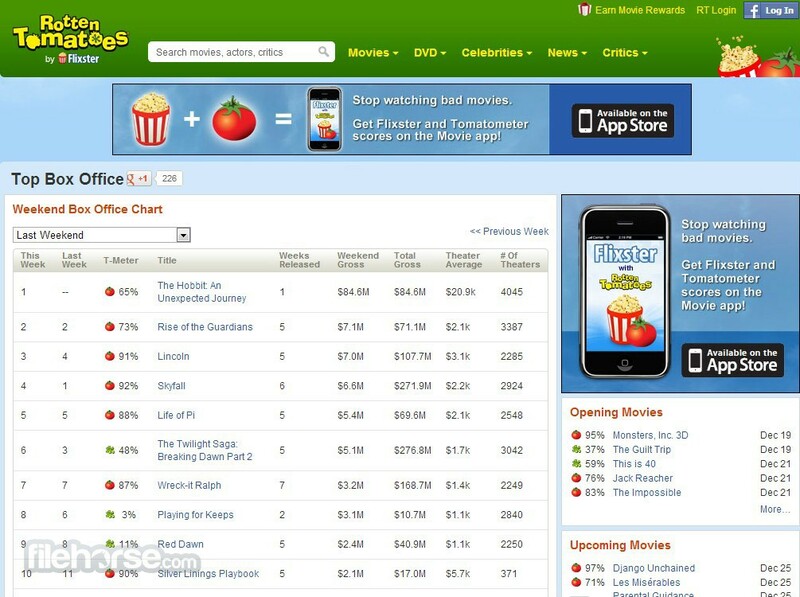 Rotten Tomatoes is a 100% free website, with design that allows minimal advertisements (usually you can find only unobtrusive ads that are promoting official app for iOS devices, or movie streaming service Flixter which is owner of Rotten Tomatoes). Registration process is easy, requiring from you either to use your Facebook credentials or to manually fill in form with your Email address, first and last name, gender, date of birth and country of residence. Additionally, to finish registration process you need to fill captcha. As the most popular aggregator of movie reviews and site with the wealth of content that is uploaded to it on daily basis, Rotten Tomatoes represents a site that every movie lover needs to visit.